Bio: Tyler grew up in Seattle but attended Western Washington University. He turned professional in 2008 and has had a number of top finishes in local chapter PGA events and pro-ams. Of the many roles the club pro plays, Tyler says teaching and running club tournaments are his favorites. Teaching Philosophy: My approach to teaching is determined by the student’s ability, health, and motivation. I believe certain ‘quick fixes’ can be effective for short-term improvement, but that long-term solutions will have a more lasting effect and improve the player’s abilities. I prefer to work with a student over a long period of time in order to develop a strong working relationship, but I can happily provide short term fixes – whatever the student is looking for. Ultimately, my goal is to improve their enjoyment of the game by enabling them to play to their potential. There's only one way you're ever going to hit powerful irons shots, loaded with backspin, that grab on the green and consistently leave you makeable birdie putts. And that's by transferring your weight on to your left (front) foot and hitting down on the ball. Look at the image on the left. Yes, it's posed and the position of my hands and arms is perhaps a little exaggerated. So it might not represent exactly what's happening as I bring the clubhead down towards impact. But it's pretty close. 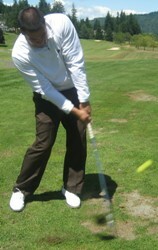 You'll notice the shaft of the club is leaning forward, my hands well in front of the ball and clubhead. It is absolutely vital the hands beat the clubhead back to this position because in order to hit powerful, piercing iron shots you simply must hit down on the ball, making contact a fraction of a second before the clubhead moves down into the turf and bottoms out. Only by transferring my weight on to my front foot am I able to produce this position. At the point of impact, I'd estimate 75% of my weight is being supported by my front leg. Consider what the likely result would be if I were to allow my weight to hang back on my right leg. The angle of attack would be considerably shallower than the ideal and I'd probably strike the turf well before making contact with the ball. Inevitably I'd attempt to loft the ball into the air by flicking at it with a sharp movement of the wrists. The alternative would be instinctively lifting my upper body for fear of hitting the ball fat, instead blading it with the leading edge of the clubhead. Either way, the result isn't pretty. A great indication you are striking down on the ball, contacting it before the turf (other than hitting a solid shot, of course) is the correct position of your divot. Ideally, it should start very slightly ahead of where the ball was sat and finish a few inches ahead of that. It should not be excessively deep - more of a slither than a clod. Because iron clubs get progressively more upright (roughly half a degree difference in lie between each iron), the angle of attack on the ball gets progressively steeper, so the divot you take with a sand wedge might be that little bit deeper than it is with a 7-iron for example. But, like I say, whatever club you're hitting you don't want the divot to be more than about an inch deep. In summary: With iron clubs, play the ball slightly ahead of center and lean the shaft forward a little. As you transition into the downswing, sense your weight moving forward on to your front foot and ensure your hands are in front of the clubhead as it strikes the ball. Hit down on it and don't be afraid to take a divot. If this feeling is alien to you, it will take a while to get used to. But it is so important you develop this move, so don't worry if your accuracy suffers for a while. The benefits of practicing and ultimately establishing ball-first contact will most definitely outweigh any temporary loss of accuracy.